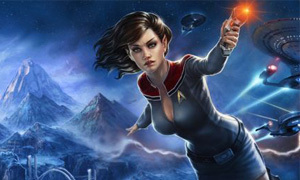 What is the Star Trek Online game? Star Trek Online is a massively multiplayer online role-playing game (MMORPG) developed by Cryptic Studios based on the Star Trek franchise. The game is set in the 25th century, 30 years after the events of Star Trek: Nemesis. Star Trek Online is the first massively multiplayer online role-playing game within the Star Trek franchise and was released for Microsoft Windows, PlayStation 4, OS X, and Xbox One. Star Trek Online is a famous online video game adapted from a science fiction film in same. In STO, each player controls their own space ship to travel in the vast space, controlling their fleet in engineering, tactical, and science systems. They can also control their avatar to have a fight with enemies on ground. You can play STO in two kinds, to maneuver the ship in space, which is about 80% of the game, or to act as a character on ground, just like other role-playing games. Despite also being published for many years, the free to play MMO Star Trek Online is still popular, all things considered. Why players should Buy Star Trek Online Credits (STO Credits) online? Star Trek Online Energy Credits are the main form of currency in the game. Players can use these credits to purchase various things ranging from new ships when the player reaches a new rank to new weapons (Space and ground), deflectors and shields. If you want to get good ranking in the game stand out of others, you should buy Star Trek Online Credits (STO Credits) from Joymmo.com store.